In light of referendum result we have issued this statement regarding our future: There's a case to be made for the Union, based on a history of joint commercial endeavour and the shared fight for social justice. But it's been hard for the British Establishment to make as both have been traduced by its shared, neoliberal ideology. A new survey in the Architect's Journal has revealed that two thirds of architects in Scotland are planning on voting for independence. 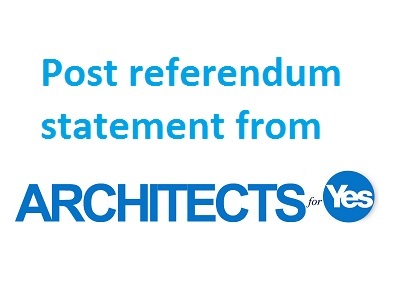 Architects for Yes are delighted to announce that we will be holding a public meeting at the Council Room, 15 Ruland Square, Edinburgh on Monday the 8th of September (tonight). Independence follows dependence, "being controlled by someone or something else". What is Scotland dependent on, to be retained or rejected on September 18? Does the referendum address Scotland's future as having political integration with friends and allies, pursuing relentless distribution of opportunity, and eschewing royalty and aristocracy: a future suited to Scotland's core? Some of our members reveal reasons why they are voting Yes on September the 18th. If you would like to share your reasons for voting Yes or why you think independence will benefit our profession and Scotland then please leave a comment on our declaration form or send us an email. We would be delighted to share your views. As architects, we are trained to embrace change - indeed to anticipate, imagine and plan for it – and now we have an opportunity like never before to demonstrate our value to society and the nation. Architecture can play a significant role in the development of communities and wider society. It is architecture which provides the background for a nation; persistently it projects who we were, who we are and who we want to be. The last decade has changed Scottish society for the better, Scotland’s cultural output has grown and its architectural confidence risen.